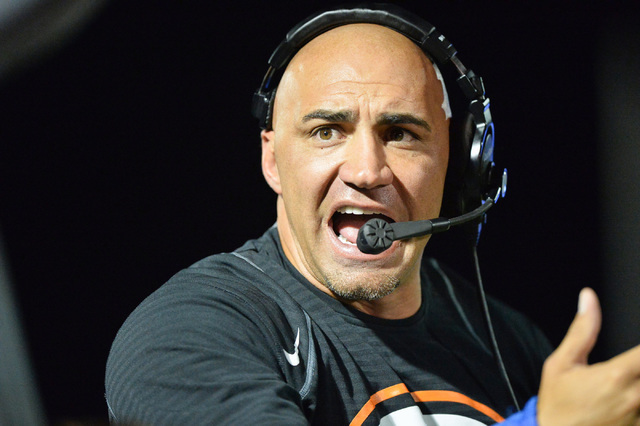 Kenny Sanchez, the head coach of Bishop Gorman High School’s football team, the top-ranked team in the nation, is facing a domestic battery charge, the Las Vegas Review-Journal has learned. 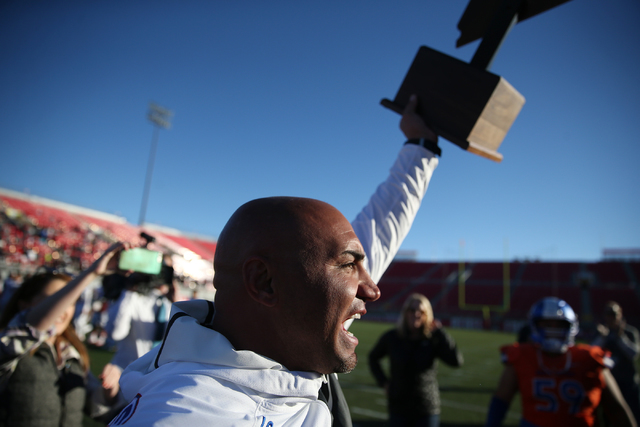 Kenny Sanchez, the head coach of Bishop Gorman High School’s national champion football team, was arrested this week on a domestic battery charge, the Las Vegas Review-Journal has learned. Court records show that Sanchez, 36, was arrested Tuesday on a warrant. When reached by phone Thursday, Sanchez hung up after a reporter asked to talk to him about the criminal case. His attorney, Ross Goodman, said Sanchez was unaware that he had a warrant for his arrest. The charge stems from an incident on Christmas Day at the home of Sanchez’s former girlfriend, Brooke Jade Stewart. Sanchez went to the woman’s residence in the southeast valley that day to pick up their son under a custody agreement. Stewart “suffered swollen/bruise right cheek and scratches in the neck area,” according to the report. She also told police that on the morning of Dec. 17, she went to pick up her son from Sanchez’s apartment, and “Kenneth was angry and punched her in the left eye.” She showed an officer a picture of the injury she had taken on her phone. Goodman appeared Thursday on his client’s behalf for an arraignment in Las Vegas Justice Court on one count of domestic battery, a misdemeanor. Sanchez was arrested after he called police to report a separate incident, the attorney said. A trial date has been set for May 30. 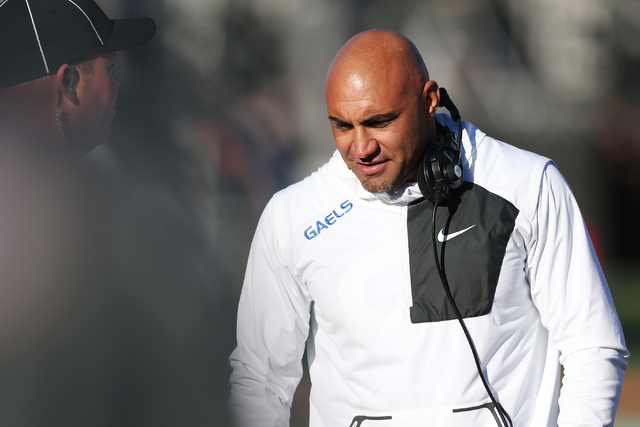 Sanchez has been the head coach for two years, in which time the Gaels have gone 30-0, won two state titles and two mythical national championships. They currently are on a 54-game winning streak, which began in 2013. Before taking the head job, Sanchez was the defensive coordinator from 2009-14. Since he has arrived at the school, the Gaels have become a national power, going 115-5, winning eight state titles and three national titles. 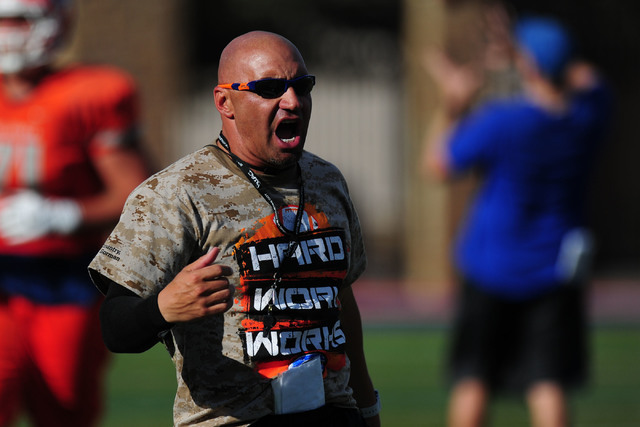 Sanchez is the brother of UNLV football coach Tony Sanchez, who preceded him as Bishop Gorman’s head football coach. Kenny Sanchez was rumored to join his brother on the Rebels’ staff if the NCAA passed legislation to allow a 10th assistant coach. Liz Ortenburger, executive director at Safe Nest, a shelter for victims of domestic violence, pointed to the importance of role models for children. Review-Journal writer Justin Emerson contributed to this report. Contact David Ferrara at dferrara@reviewjournal.com or 702-380-1039. Follow @randompoker on Twitter.